We all have our food phobias, preferences, and various other issues. Kurt doesn’t have very many food issues, but every once in a while he surprises me with a new one. For instance, sometime in the last year, he decided rice salads should always be avoided. I don’t know what a rice salad ever did to him, but he made the decision and stuck with it until last night. When presenting this dish, I slyly called it a Thai salad and left the rice word out of the title. That worked well enough for him to taste it before pointing out that he could see that it was a rice salad. But, one taste managed to change his mind. That’s how good this salad is. This bright, freshly-flavored, mind-changing salad is from none other than Donna Hay and is found in Off the Shelf . I wasn’t kidding about the proliferation of salads and recipes from that book this week. So, if you were wondering what would be a great make-ahead item that you could leave in the refrigerator, that would have incredible flavor even in its chilled state, and that you could enjoy for a few meals, well you found it. Make a big bowl of this salad and enjoy. The recipe is very quick and simple, and if you have some leftover chicken it’s even faster. I used leftover grilled chicken, but any cooked and shredded chicken would work. Then, cook some rice. I went with jasmine rice, and I always follow the process I learned from Saveur years ago. That process involves swishing the rice in water, draining, and repeating until the water remains clear. Then, the rice is boiled in a saucepan for a few minutes before the heat is turned to low and the pan is covered for 20 minutes. Last, the pan is removed from the heat and left to sit, covered for 10 minutes. The ratio from that article, from so long ago I don’t remember what year, was two cups of rice boiled in two and three-quarters cups water. It always turns out great. So, with cooked chicken and cooked rice, all that was needed to be cooked for this salad was some briefly sauteed green onions, chopped red chiles, and finely chopped lemongrass. 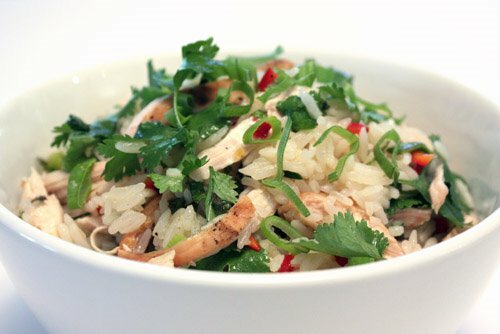 Once sauteed, those items were combined with the cooked and cooled rice, the shredded chicken, some shredded mint, cilantro leaves, and shredded kaffir lime leaves which I actually found at the grocery store even though I usually don’t. Then, a dressing including lime juice, a little sugar, and fish sauce was poured over the salad. It was tossed to combine, and the salad was left in the refrigerator until ready to serve. I tasted the salad as I made it, and the lime and lemongrass flavors were front and center, but I wondered if it would become a little dull after being chilled. It did not. The lime leaves, lime juice, lemongrass, fish sauce, mint, and cilantro all contributed to the flavor burst that was still there after the time spent in the refrigerator. I was very happy with the salad and surprised that Kurt not only tolerated it but found it to be quite good. I don’t know that this has opened the door for other rice salads, but I do know this one will be welcomed when I make it again. one bowl wonders are always wonderful....this looks so good and perfect sounding cold. Ahh, rice! So very dear to my heart and appetite! 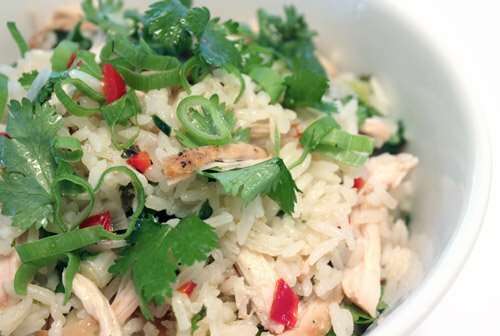 This rice salad sounds perfectly refreshing and so easy to make; no wonder it had the power to change Kurt's mind. I love all the fresh herbs in this, although I have yet to use kaffir lime leaves. I cook rice similarly to the method you describe, but I don't measure out the water, using instead finger-measurement: I smooth out the rice grains in the water so that it's an even level, then dip my forefinger straight down until the tip is just touching the rice. I look for the water to reach just below the first crease/joint of my finger - about 3/4" above top of the rice. Add or reduce water as needed. It works like a charm! that recipe looks great, where do you get the lime leaves, asian grocery? What an excellent recipe this is. Pure deliciousness! I'm getting more and more curious about lemongrass. This salad looks fabulous and so filling. That sounds so fresh and delicious. I love rice, so this is right up my alley. Though I have never used lemongrass before, or fish sauce. I've never had rice salad before. If it's good enough to fool Kurt in liking rice salad's again. Then It's good for me. The flavors in this delicious rice salad sound amazing! I'm a rice eater but I wonder why making rice salad didn't occur to me before? ?This looks delicious! I may have to get Donna's book now, with all the great recipes you've shared I am very intrigued. Problem is that my recipe book shelf space is limited - ahh the dilemma. I don't think I've ever had a rice salad! And this sounds wonderful, especially since it made a rice-salad hater change his mind(fingers crossed). I almost always have leftover rice and chicken, at least once a week - this would be a great use. A phobia against rice salads? Haha, that's the first time I heard of it, but obviously he can't say no to THIS amazing dish! Sophia: I forgot about bibimbap which Kurt does like. His issue, I suppose, is just with cold rice salads. He's weird, what can I say? A beautiful salad! I love cilantro too. This came together in a fine way -- glad you enjoyed it! Thanks for sharing!! This sounds like a perfect dish for these warmer days. I don't dislike rice salads, but I tend to forget about ever making them. Oh sure, who doesn't make pasta salad in the summer, right? And of course, couscous salad, too. And potato salad goes without saying. Bur for some reason, rice doesn't always spring to mind for that. Thanks for the great reminder to mix it up in my repertoire. delicious one bowl meal. i rarely make rice salad, but they are so perfect for summers. love lemon grass. Very innovative, Lisa. All the great Thai flavors are there and I can imagine how delicious this salad must be. Great job, as always. Very nice rice salad, perfect for these few weeks when it's so hot everywhere. I am totally inspired to make something similar. You salad looks appetizing! I love the way you used lemongrass in your recipe: it must had such a nice flavor to your salad! we're eating almost ONLY salads now with the heat here in france and this is a keeper...lokks light and delicious! This looks delicious! Where do you find your lemon grass? I seem to have trouble locating it. chef fresco: I only occasionally see lemongrass with the fresh herbs at the grocery store, but I have some planted in my herb garden. The stalks on my plant don't get as large as the ones I sometimes see at the grocery store, but at least my plant survives the heat of the summer in garden. It's probably easier to find in an Asian market. Perfect! I love Thai food. That refreshing and flavorful salad is mouthwatering! Love this cold salad theme you've got going. Exactly what I feel like eating in the summer. Yum! The beef version of this dish with rice noodles is a favorite of mine when we're eating out Vietnamese. I'd love to try it this way with rice instead of noodles. I love flavoured rice! Such wonderful flavours! That rice bowl looks good. I like al of the green herbs. I arrived here after reading your Nyona Style Fried Chicken (which I have to make). LOVE all of these flavors.